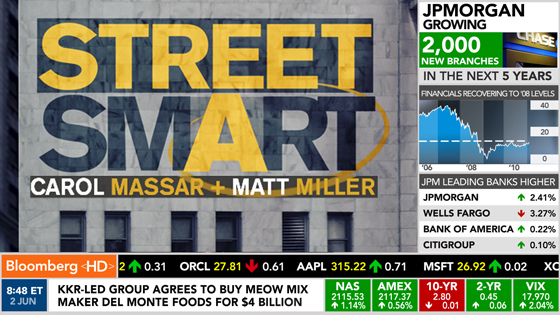 With the recent launch of Bloomberg Television’s new HD channel in markets across the country, including Time Warner Cable in New York, the 24-hour business and financial news network has recently introduced state-of-the-art new graphics, design and music. We spoke with John Newhouse, creative director for Bloomberg Television, to get an insider’s perspective on the new look and feel and the decision-making and production processes. What we found out is that Bloomberg HD, much like its parent company Bloomberg L.P., is all about the numbers. From the 2,000 Bloomberg L.P. engineers who help contribute charts and graphs, to the over 10,000 elements created for 14 hours of live daily programming, Bloomberg TV’s new look reflects the brand’s focus on high-quality financial data and information. What brought about the change in graphics? We’ve been working on Bloomberg TV’s launch in high-definition for over a year. The switch to HD gave us an opportunity to transform our graphics and design, with better colors and more detailed and relevant information on the screen. Our parent company, Bloomberg L.P., has over 2,000 global engineers that allow us to deliver what investors want: more data. The bottom line is that our screen has three times the data of our competitors – period. How did the move to HD change the network’s decisions? Certainly, we designed all our new graphics with the HD viewer in mind. Our goal was to create a look that is different from the competition, that allows viewers to easily process the data and information and that reflects the trusted voice and high quality content Bloomberg is known for. What did this change entail? More content! We spent months working with focus groups of business television viewers to find out not only what they want to see but what is currently missing in the marketplace. What we found is that business television viewers want more, and Bloomberg HD is able to deliver that with “snapshot storytelling” as opposed to simply displaying data. Our graphics narrate information in support of our coverage, rather than spewing data. One example of this is how Bloomberg HD uses market chips in green or red to indicate market movement, enabling the viewer to easily see if markets are up or down without having to interpret complex data. What inspired this package? How did you choose the color palette? Bloomberg’s signature look is a bright color palette, using stark contrast and flat images instead of the standard “chrome and glass” look of the competition. For our background images on set, we also use rich still photos instead of computer-designed images. We think these real-life images tell more of a story than the usual graphic interpretation. What challenges did the move to HD bring about? Beyond the normal technical challenges, deadlines and issues, our biggest challenge was knowing when to stop. We’re flush with so much information, how do we not overwhelm the viewer? Our challenge was to find a way to display only the most relevant information in a quick, visual snapshot that viewers can easily understand. How are you taking advantage of the extra HD space and resolution? The new 16×9 format gives us more real estate to play with. Every two minutes, the viewer is getting ten new pieces of freshly updated information, displayed on three different quadrants. We hired 6 new writer/researchers whose sole responsibility is to populate this new HD real estate. 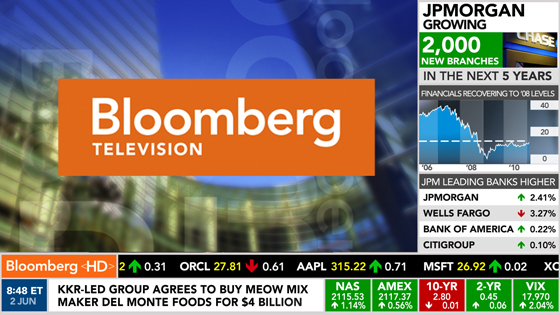 View more examples of Bloomberg Television’s HD graphics package in the graphics section. Stay tuned for final part of our interview Friday.